It is essential to understand that the Bible is God's word and as the word of God we need to realise that it will be difficult to understand at times (Isaiah 55:8). I love to use the illustration of someone praying for the Lord to speak to them through His word, closing their eyes, opening their Bible, and pointing to a verse. When they look at where their finger is pointing, they see Matthew 4:9, "And saith unto him, All these things will I give thee, if thou wilt fall down and worship me." With delight they read that if they worship God, they can have what they want. So this person goes on cheerfully through their day. Little did they realise that in context, the person that said this was Satan himself while he was tempting Jesus. Another example of a verses that is often taken out of context is 2 Peter 1:20, "Knowing this first, that no prophecy of the scripture is of any private interpretation." This verse is often misinterpreted, but in context, what it is saying is that the human authors of the Bible did not invent the words that they wrote down. It was not their own opinion or their own words. Instead, they wrote down exactly what they were given by the Holy Spirit. 2 Peter 1:21 "For the prophecy came not in old time by the will of man: but holy men of God spake as they were moved by the Holy Ghost." 2. 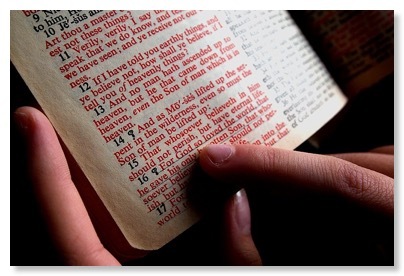 Compare scripture with other scriptures. If we are going to develop sound doctrine (2 Timothy 4:3) in our lives, we need to learn to compare scripture with scripture. An excellent book for this is the "Treasury of Scripture Knowledge" which can be found free in many computer Bible apps. Why is this important? Well, consider this example. In 1 Corinthians 9:22 Paul says, "To the weak became I as weak, that I might gain the weak: I am made all things to all men, that I might by all means save some." Very often this verse above is interpreted to mean that Paul was willing to do anything to reach the lost, including adopting their lifestyle. This interpretation is used to condone the modern, hyper-grace, seeker-sensitive movement, or "man-centred movement" as I like to call it. But, when we compare scripture with scripture, how does this interpretation stand? In Galatians 5:13, the same Paul that wrote 1 Corinthians 9:22 also wrote: "For, brethren, ye have been called unto liberty; only use not liberty for an occasion to the flesh, but by love serve one another." Here the apostle Paul is saying that we have liberty in Christ but we are not supposed to use that liberty to live for our flesh (Galatians 5:16-25). The Apostle Paul also taught that believers are supposed to "Abstain from all appearance of evil." (1 Thess. 5:22). We can see that the interpretation for the seeker-sensitive movement is not consistent with other things the Apostle Paul wrote. Instead of being seeker-sensitive, Christians should seek to be Saviour-sensitive and aim to please Christ, not men. In light of the other verses, Paul was saying in 1 Corinthians 9:22 that we should seek to level with people, to meet them where they are. For instance, if someone uses manners, we should learn manners and use them when we are with them. On the other hand, we should also know how, and be willing to, use our fingers to eat our food, so as not to make people think we are looking down on them. It is not referring to living in the flesh to reach the world. 3. Let the clear scriptures interpret the ones that are less clear. The overall teaching of the Bible cannot be overthrown by single passages. 4. Read the Bible literally, and allow it to define its own figurative words. We should read the Bible literally. If the literal sense of a verse, or passage, is not followed, the student becomes a slave to the "enlightened" teacher(s). They become the ones who have the "real" key of understanding. In other words, the interpreter becomes the authority, and one can never be sure what the Bible truly means. Does it mean what it says, or what this teacher is telling me it says? An example of this is that we can see that literal interpretation can be applied to the Old Testament prophesies, because they were fulfilled literally in the New Testament. There are times the Bible uses figurative language, but it usually defines it as well. As I mentioned earlier, if a verse does not mean what it literally says, it could mean anything that any interpreter says it means. By using the allegorical method to interpret the Bible, the teaching is thrown into a complete and permanent uncertainty. Reading the Bible literally helps to keep us from the deceit of false teachers.